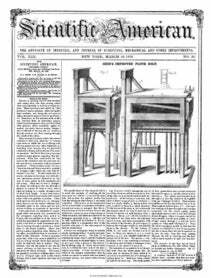 C. A. Chamberlim, of Alleghany City, Pa., has invented a new machine to facilitate the mining of coal. It is principally intended for " undermining" and " side-cutting " seams of coal, but it is also applicable in other mining or tunneling operations. It consists chiefly of a cutter wheel, furnished with an arrangement of cutters, to cut in a direction perpendicular to its axis, arranged in a carriage, which is fitted to travel upon a stationary frame, and a feed screw, or an equivalent device, for moving the said carriage and cutter ' wheel in a direction perpendicular to the axis of the cutter wheel, for the purpose of moving the wheel forward as it cuts into the coal or other substance. The machine cuts a groove or narrow cavity directly into the walls of a mine, parallel, or nearly so, with the floor or walls, and as close as desirable, in such a manner as to admit of large masses being removed at once by wedges or blasting ; thus saving the miners stooping in such unnatural positions as they now do, to pick away the floor, and saving much time. This valuable invention was patented this week in this country, and on January 9,1858, in England.